I especially missed the kitchen gadgets. It has been so frustrating being a food blogger with no kitchen tools. However, this week, I have been making up for lost time and have been experimenting a lot in the kitchen. As soon as Finn saw the Ninja (blender) he was begging for a smoothie and so that is what he got! We have had a version of this smoothie for the last couple of days as I perfected the recipe. It is jam packed with spinach so I was more than happy for the boys to be my taste testers. Spinach, pear, dates, ginger and water make up this vibrant smoothie. You can serve it in a glass or make more of a meal out of it. Pictured is how I served it, poured into two bowls with a good dollop of greek yoghurt and some LSA mix to add a protein kick. LSA mix isn’t something I had heard of until I moved to Australia. I don’t think I ever saw it in the UK but it is really popular here and I picked up a big bag of it in Aldi. LSA is a combination of Linseeds, Sunflower Seeds and Almonds which have been ground down to a fine or coarse form. I love it and have been adding it to a ton of different recipes. I think it is evident from the bowls below that this smoothie was a big hit with my boys and I hope you and your kids love it too. 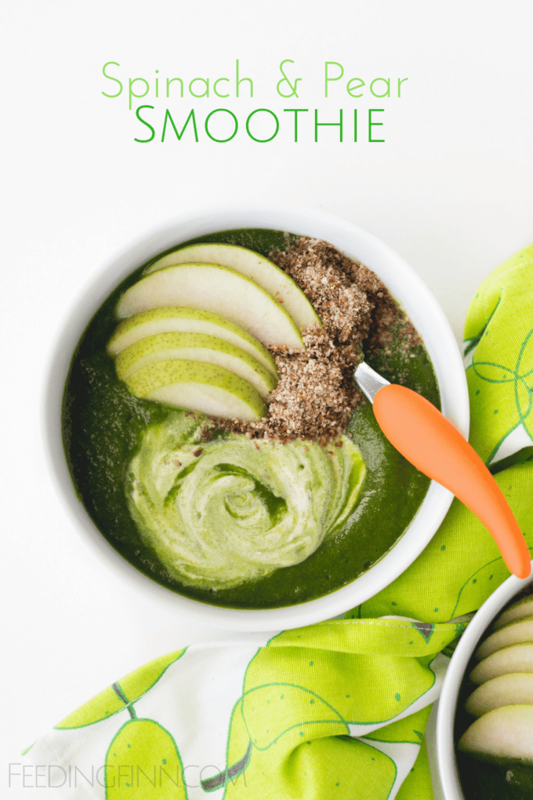 A vibrant green smoothie packed with spinach, pear, ginger and dates. A great way to get your kids to eat their greens. (Serving suggestion) Pour the mixture into two bowls. Swirl in 1/2 tbsp of yoghurt to each bowl add 1/2 tbsp of LSA mix, top with thinly sliced pears. **Depending on the size of your blender you may have to add the spinach in stages. I added about a 1/4 of the spinach, blitzed it and then added the remaining spinach before blending again. This looks great. Look super duper healthy too. Have to try it later. Awesome smoothie!! Thnx fornthe recipe!! !